We’ve recently helped make a small UK charity’s exhibition a huge success through international social media. 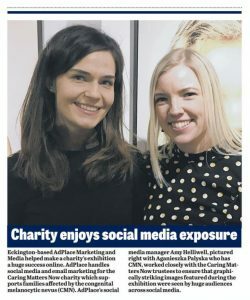 AdPlace handles social media and e-mail marketing for the Caring Matters Now charity that supports families affected by the condition Congenital Melanocytic Naevus (CMN). Caring Matters Now recently held their ‘How do you C Me Now?’ exhibition in the Oxo Tower Wharf Gallery in London. It featured a series of photographs of children and adults born with CMN, a rare, untreatable and potentially life-threatening skin condition. The exhibition of 30 portrait images taken by celebrated photographer Brock Elbank. Elbank, who focuses on specific physical features, drew over 8,000 visitors. His photographs showed individuals with CMN from all over the world, many of whom visited the exhibition to discuss their condition with visitors. AdPlace Marketing’s social media manager, Amy Helliwell, worked closely with the Caring Matters Now trustees to ensure that the graphically striking images would be seen across Facebook, Twitter and Instagram by the largest possible audience. The social media and email campaigns by AdPlace Marketing ran before and during the exhibition. To find out more about Congenital Melanocytic Naevus and Caring Matters Now, please visit the Caring Matters Now website via this link. Read more about our online marketing services at the web page.